Dark underarms are quite embarrassing specially when your wear your favourite sleeveless dress but your dark underarms ruin your entire charm. Accumulation of dead skin cells, improper skin cleansing, friction due to wearing too tight blouses and tops, excessive use of hair removal creams, excessive use of alcohol-based deodorants and antiperspirants are some common cause behind dark underarms. Natural skin bleaching properties of lemon juice are very beneficial in getting rid of dark underarms. Take a slice of lemon. Rub it on your armpits in a circular motion. To enhance the effect of lemon juice, you can sprinkle some salt on lemon slice and gently rub your underarms with this natural lemon and salt scrub. This will not only help in exfoliation of dark dead skin cells but will also help a lot in lighten your skin tone. Do this every day while taking a bath.Within few days you will observe the difference. Take one tablespoon of lime juice, one tablespoon of coconut oil and a pinch of turmeric powder. Mix them well to make a thick paste and apply it on your armpit. Rinse off after 20 minutes. Make a paste from one tablespoon of curd, one teaspoon of gram flour, and one teaspoon of natural milk. Mix a pinch of turmeric powder. Apply this mixture on your underarms. Rinse off after 15 minutes. Make a paste by mixing 1/2 teaspoon of turmeric powder,1 teaspoon of coconut milk,1 teaspoon of olive oil and 1 teaspoon of lemon juice. Mix them well and apply on Dark Underarms. Let it stay for 15 minutes then rinse off with lukewarm water. A mixture of sandalwood and rosewater is also very beneficial in getting rid of dark underarms. Apply a mixture of rose water and sandalwood powder on your dark underarms and rinse off after 15 minutes. Take 1 tablespoon of papaya pulp, 1 tablespoon freshly squeezed lemon juice and 1 teaspoon raw honey. Mix them well to make a thick paste and apply this paste on your underarms. Rinse off after 15 minutes. 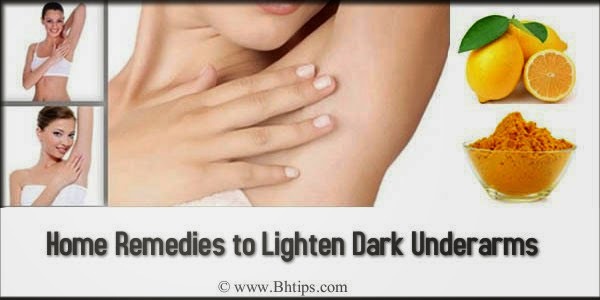 A combination of baking soda and vinegar is also very beneficial in getting rid of dark underarms. Make a paste by mixing 1 tablespoon of baking soda with 1 tablespoon of vinegar. Rub this on your underarms twice a day and do this for a few days to lighten the dark skin of underarm. Take 4 tablespoon of potato juice, 1 tablespoon of yogurt, 1 teaspoon of sandalwood powder and 1/2 teaspoon of turmeric powder. Mix them well in a small bowl to make a fine paste. Apply this paste on your dark underarms. Leave it on for 20 minutes and then rinse off. Prepare a paste with one teaspoon of lemon juice, one teaspoon cucumber juice and a pinch of turmeric powder. Apply this paste on skin of underarms and leave it for twenty minutes. Then rinse off with fresh water.Regular application of this mixture will show you remarkable result within 2 weeks. Skin bleaching properties of lemon and potato juice are very helpful in getting rid of dark underarms. Take equal amounts of lemon and potato juice. Mix them well and apply on your underarms with help of a cotton ball. After 20 minutes, rinse off your underarms and pat dry your skin. Take some dried orange peels powder and mix the powdered orange peels with some rose water and milk to make a thick paste. Use this paste to scrub the dark underarms gently for 5-10 minutes. This will help a lot to remove dark dead skin cells and will definitely lighten the dark skin. Take one tablespoon of lemon juice and mix with 1 teaspoon of honey to make a thick paste. Now apply this mixture on your armpits before a shower or bath and left to dry for 20-30 minutes. Finally rinse off with with warm water and pat dry your skin. (i) Avoid deodorants with strong smell because they have strong chemicals that can give your underarms a dark complexion. (ii) Just like your face and neck, maintain proper hygiene of the underarms. You should wash your underarms regularly and thoroughly while taking bath and pat dry the underarms properly to avoid moisture on the underarms. Presence of moisture on the underarms can increase the incidence of infection on the under arms. (iii) Instead of shaving your underarms prefer waxing because waxing not only remove your underarm hair but also remove dead skin cells. (iv) Avoid wearing too tight blouses and tops because they cause friction against the skin and gradual friction may lead to darkening of underarms. (v) Drink 10 to 12 glasses of water on a daily basis. Water not only helps in flushing out the toxins but also improves skin complexion.